If you ever find yourself in Las Vegas, you need to tear yourself away from The Strip and make the short drive to the Shelby American Museum, Showroom and Gift Shop. Located on 6755 Speedway Blvd it’s located just before you get to the Las Vegas Motor Speedway. For directions call: 702-643-3000 or just use your GPS. Tours are conducted only at 10:30am. Monday through Saturday and are free and require NO reservation or registration. The Shelby Museum and Gift Shop is open Monday – Friday from 8:00am to 5:00pm and Saturdays from 10am – 2pm PST. If you plan to go on the tour, plan on arriving at Shelby by 10:15am . Tip: if you decide to come on a Tuesday after a holiday weekend, it’s gonna get crowded. Get this: Not only do you get a guided tour of the museum by a Shelby employee but they take you into two factory areas but alas no cameras are allowed. The first stop is where continuation series Cobras are made and when work was underway on three models, one in Fiberglas and two in aluminum. Shelby actually uses the stamped aluminum bodies produced in Poland by Kirkham Motorsports. next stop is the much larger Mustang facility while many different Mustangs and Super Snake models are assembled. Throughout the tour questions are solicited by the knowledgeable tour guide, so come armed with a few. Then it’s off to the museum. The cars in the museum are always changing and includes some of the most famous cars ever produced from the first Cobra CSX2000 to prototypes of the Series 1, Shelby GT-H, Terlingua, GT500KR, and others. But no Shelby Daytona coupes but ya never know. Don’t miss the gift shop. I may never be able to own a real Shelby Cobra (but my fingers are crossed for owning a Shelby GT sometime) but I can afford a T-shirt or two and I bought a jacket as well. 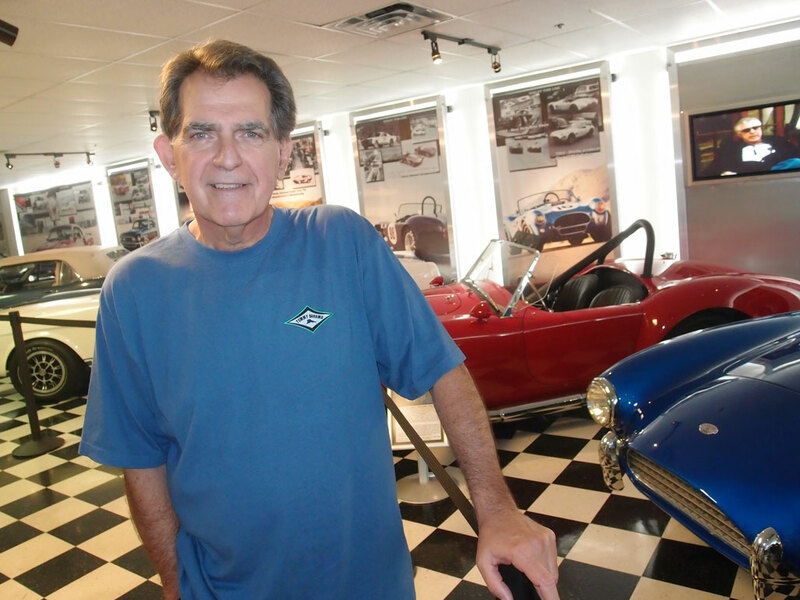 Best of all the people who work at the Shelby American Museum, Showroom and Gift Shop are some of the nicest people you will meet in Las Vegas.